So back on the topic of cyborgs (previous discussion here). Such Carbon-based life forms as we are, we are so fragile. There are so many things that can kill or damage us. Certainly we cannot bear the harsh realities of leaving our planet, without complete reliance on devices of our making that are never fail-proof. Protecting an astronaut mechanically and enhancing him electronically might be the only way to guarantee survival. In fact, the term ‘Cyborg’ was first used in 1960 as the proposed way to approach space exploration, when it was becoming a reality. It was – and probably still is – the next step in human evolution. So while today’s space related companies and start-ups explore and design the capsules that will protect us on the way, the space suits that we will have to wear, and the habitats or artificial structures in which we will have to live when leaving Earth, the long term future holds these options: Terra-forming (changing the environment), going mechanical (cyborg, changing our body by mechanical integration), or gene manipulation (changing our body biologically, seeding other worlds with genetically modified humans who can survive in the alien environment). All 3 options are common and discussed widely in Sci-Fi. We might have other motives to ‘go mechanical’. We are so high maintenance. Think about how much time and effort is spent every day, on sleep, eating and food preparation, making clothes and building shelter, self grooming and taking showers, even exercising due to worrying about our weight and/or health. 90% of such worries go away when you are a cyborg. Yes, they need some maintenance, but not that much. Don’t you sometimes consider it might be very cool to become one? But ‘coolness’ and being tired of your daily routines might not be enough of a motive as of yet. A much more compelling motive would be a physical impairment. 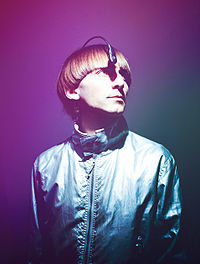 So while this is not yet applied for the purpose of space travel, extensive medical research has already enabled several individuals to overcome disability and impairment and become real modern-day cyborgs, with brain-computer interfaces controlling limbs, sight, and sound, with hearing or retinal implants, artificial hearts, and more. This doesn’t even count biological parts grown artificially, such as veins or skin. 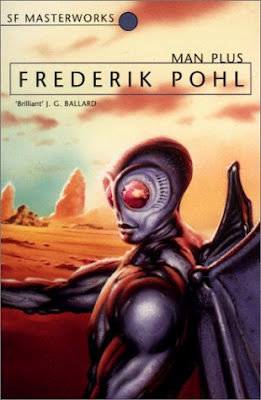 Man Plus (1976 by Frederik Pohl) – An excellent example is in the brilliantly written novel. It’s the story of an astronaut who was modified, so he can go to and survive on Mars. The extensive operations on him were initiated to save his life, after being fatally injured. But he becomes so alien, a true Martian, he turns his back on his ex-fellow humans, and can’t relate to them anymore. This is science fiction at its best, examining future technology, and then describing how it might affect and change us, in a completely plausible way. It can happen. It can absolutely happen exactly as described. 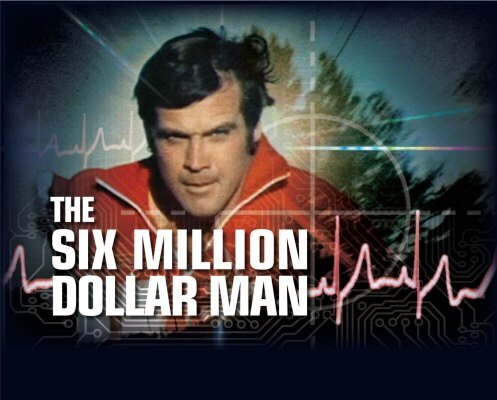 Steve Austin – The 6 Million Dollar Man (TV 1974-1978) – is really also a cyborg. Replacing parts of a human being with artificial components that make him better, stronger, faster – what else would you call it? 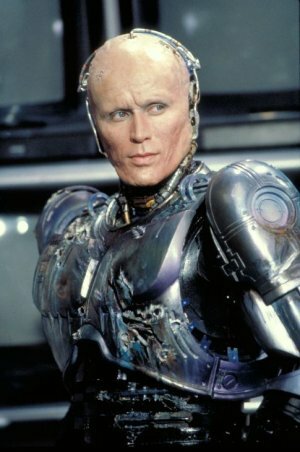 Robocop (movie 1987) – sort of the same idea as Man Plus. A police officer is fatally wounded, and then goes through extensive surgeries that turn him into a walking weapon. What’s added to this story that is reused later, is that some control is built into him so that he loses his memories and free will. 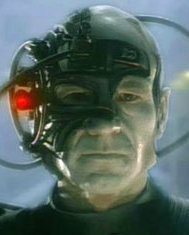 Captain Jean-Luc Picard of the Star-Trek Next Generation (TV 1987-1994) – was turned into a cyborg by the Borg. Luckily that change was only temporary… But the Borg themselves are a hive of cyborgs. Lieutenant Barclay (of the same Star-Trek Next Generation) – due to an action by an alien probe, his intelligence surges and he’s able to integrate his mind into the ship’s computer. This qualifies him as a cyborg, because he becomes human intelligence controlling mechanical parts. Wikipedia is correct, that you could look at any mechanical enhancement to the human body (like a knee replacement or pace-maker), and say that it’s cybernetic, but I think when we say Cyborg we refer to a more extreme change, that affects the human psychologically. However, I disagree with the definition of Cyborg that includes any entity that has a biological and mechanical combination. If the intelligence is not biological, it’s not a cyborg. So the Terminator (movie 1984), for example, doesn’t qualify. The Terminator is a robot that looks human. The jury is still out about the Cylons (featured in BattleStar Galactica, TV 1978, remake 2004-2009, and Caprica, TV 2010 Photo credit: blog.samuraiprojects.com) – I have to think about that one a bit more. This entry was posted in Cyborgs, Human Experience, Sci Fi and tagged Borg, cyborg, man plus, Mars. Bookmark the permalink. Ok, thought about it. This is very confusing. The Cylons started as a human consciousness that was downloaded into a robotic body. That would qualify the first one as a cyborg. But then this cyborg somehow ‘awoke’ a consciousness in a bunch of other robots. There was nothing human about them, so I’d have to conclude those were robots, even though they became spiritual and wanted a god to believe in. Later they were all getting their consciousness into cloned human bodies – so at that point they became androids. Maybe I should stick to simpler stories next time.